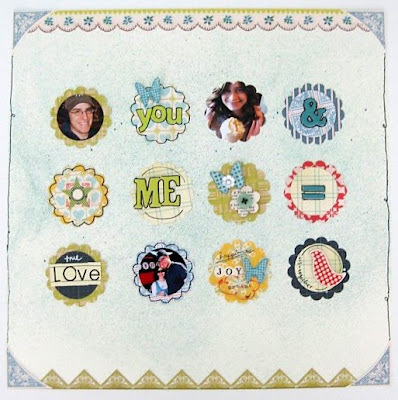 I created this with the September Studio Calico kit, which is swiftly becoming a pile of shreds (which feels awesome). This page is basically a celebration of my new scallop and circle punches, purchased with 50% off coupons from A.C. Moore. 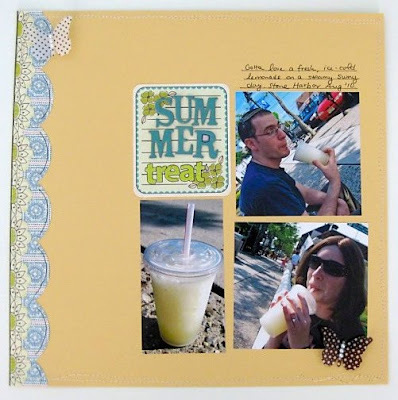 This next one is not my favorite design-wise, but it gets the job done, and records a fun, happy memory of drinking lemonade at the side of the road with S at the Jersey shore this summer. And now, another explanation for why I'm about to fall off the face of the earth again! Orthodox Jews observe a whole bunch of major holidays all within a month of each other, which leads to an especially crazy fall. When I was in law school, having to miss classes for holidays added an extra level of chaos to the mix! This next holiday coming up is called Sukkos, and since I have maintained for years that this holiday really needs a PR team, I'll give it a go right now! But more seriously, Sukkos is about trusting in G-d rather than always relying on the comforts of our own homes, and about the unconditional love of G-d. If you want to know more, feel free to check out Aish, a Jewish website with great explanations! First of all, gorgeous pages. As usual. Second, I love learning about our world's religions, so thanks for sharing about yours! You aren't going to grow a big white beard are you??? ;) Have a good holiday! Love hearing more about your religion and holidays! I definitely come here to learn something new each week! I think both of the layouts are great! You're too hard on yourself, but aren't we all? 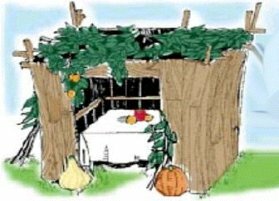 Question...do all Orthodox Jews eat in a hut like that? What if you don't have a back yard? I'm not being funny, I seriously am puzzled! great layouts. hope to be joining you on "shredding the kit to pieces". love the fact that you shared a bit of religion in this post. thanks for the bit of insight. have a good one! Thank you for explaining the different customs of your faith. I find it so interesting! I love your pages. Great job! Your pages are both awesome. Love your layouts.....and love your explanation of your customs. I've gotta ask though....why is it that you leave out the "o" in God? I see some people do that....but I don't understand the meaning behind it??? Sorry if that sounds lame...I honestly don't know! Enjoy the holidays! Lovely layouts and how fun that the kit is just little bits now! :) I know what you mean about it feeling awesome! Wow - those layouts are beautiful - also really love hearing about your religion. I think that it's really cool to hear about a young person celebrating their faith - so cool! LOL . . . your post made me laugh! Great PR, indeed. :) Chag Sameach! I adore both of these layouts. You have a great eye for design!